Shigeru Mizuki is the preeminent figure of "Gekiga "manga and one of the most famous working cartoonists in Japan today-a true living legend. 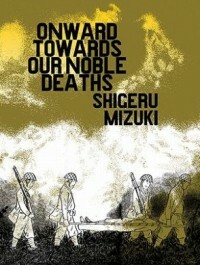 "Onward Towards Our Noble Deaths "is his first book to be translated into English and is a semiautobiographical account of the desperate final weeks of a Japanese infantry unit at the end of World War II. The soldiers are told that they must go into battle and die for the honor of their country, with certain execution facing them if they return alive. Mizuki was a soldier himself (he was severely injured and lost an arm) and uses his experiences to convey the devastating consequences and moral depravity of the war.